I already knew I had a ridiculous weakness for vintage suitcases which evidently extends to old metal cases as well. 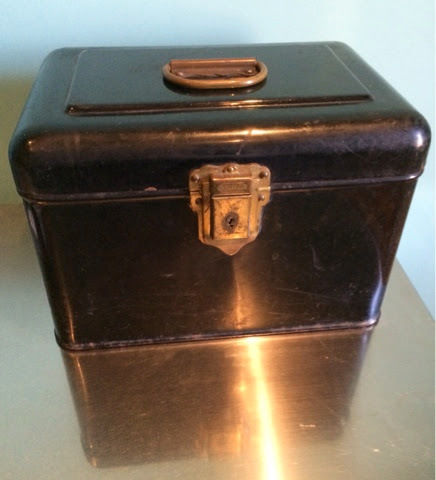 Found this heavy metal black box at the Brooklyn Flea last week and I violated the #1 rule of vintage shopping: DO NOT BRING HOME WHAT YOU HAVE NO USE FOR! Bad, bad shopper.My hoarding tendencies are showing ;) It just looked too cool to pass up! Now I've done it, what should I use it for? I could use it to store supplies but it seems a shame to put it in closet. It's cool. Can you use it to hold remotes in the man cave? Can't tell the size for sure but how about putting it on a table and keeping your playing cards in it or perhaps you like to keep pens, pencils, scissors in your living room (I do so when I'm reading the paper I can cut things out, make notes, etc.). I'm a great collector of boxes and have them all over the house with lots of things in them. My favorites are the boxes I have given each grandchild and then I put treasures in there from each of them - cards, pictures, shells we pick up when I visit, etc. Some day I'll give those boxes to each of them with love from Grandma. Thats very sweet (the box for your grandchildren). This one is pretty large (about bread box size) so too big to put out on a coffee table or anything like that. But perfect for a treasure box. That box is custom made for your passports, your insurance policies and anything else you would pick up and run with due to a fire... Agatha first, that box second!! It looks like a great place for extra keys ( with labeled tags,of course). It looks like a great place to store recipe cards! I was thinking the man cave, too! Maybe use it to make a poker "kit" -- put in chips, cards, a mat, ? store chocolate candy/candybars in it! Out of sight but still accessible.